But this is a kind of emergency, I thought. If it is basically made of sesame paste and starch that thickens it – Wouldn’t my pantry staples like tahini and corn starch do? With the plan of attack on hand, there is only one place a Japanese woman should head to when she wants to know how to cook something: http://www.cookpad.com. It is THE cooking site among Japanese with a massive collection of recipes all posted by its registered users. You will find a recipe from a toast to beef bourguignon, and anything and everything in between. There I typed “goma dofu” and hit search… Voila! 289 entries. Perfect. Using various recipes I found on cookpad.com as a reference, I improvised my version of goma dofu with tahini as a shortcut for grinding sesame as well as a reasonable substitute for costly and hard-to-find neri-goma (Japanese sesame paste). Also I added soy milk to help corn starch achieve smooth texture kuzu would have provided. This was supposed to be a quick and dirty knock-off that would be my secret guilty pleasure. To my own surprise, however, it turned out beautifully, almost looking as good as ones I had at restaurants – And OMG it was so absolutely delicious that it completely satisfied my urge and sent me straight to the sesame Nirvana (if there is one – I think there is, and I was in it). Now I am sort of feeling bad for those monks, who painstakingly grind sesame seeds using mortar and pestle, and knead sticky, heavy dough in a big pot to serve goma dofu for the temple’s guests, not even for themselves. Well, at least – If that won’t give you a good Karma, and I don’t know what will. Make sure to mix tahini well before using so you won’t end up using the surface oil. Mix all the ingredients in a medium saucepan. Whisk until everything is well blended. Wet the inside of molds you are planning to use. 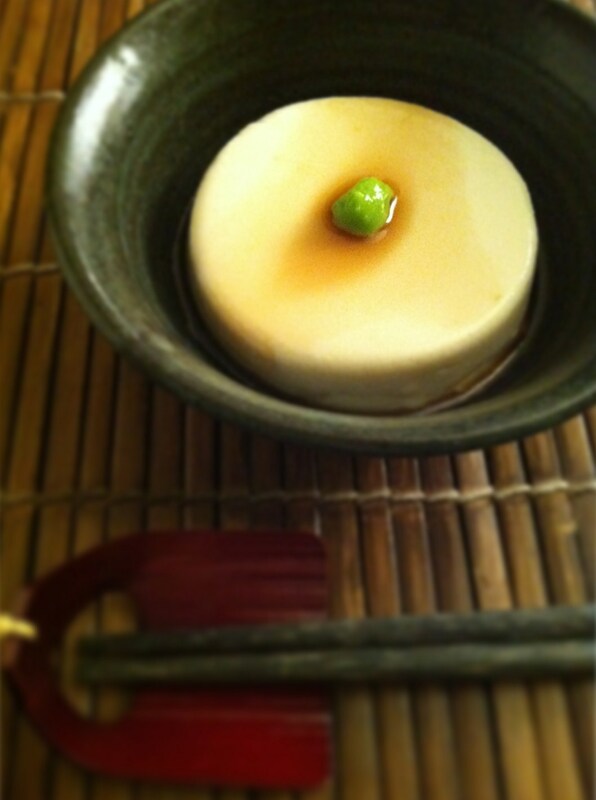 I used 8-mounce round ramekin but you can use a square container if you go for more “tofu”-like look. Also prepare a bigger container that can accommodate the molds and deep enough so it can be filled with ice water to cool them once they are done. Place the pan over medium heat and simmer, while constantly stirring with spatula. Initially the mixture is watery but keep stirring. In about 5 minutes, it suddenly starts to thicken (This part is a kind of fun – Almost like a science project!). Continue to stir the thicken mixture for another 5 minutes. Make sure you are stirring constantly from the bottom so it prevents it from sticking to the pan. Remove the saucepan from the heat and pour the mixture into 2 molds equally. Place the molds in the bigger container with ice water to cool them (do not get ice water in the molds!). Leave them for an hour until it is completely set and cold. Unmold and cut them up if necessary. Serve with wasabi and shoyu, or wasabi and mentsuyu (Japanese soup base you can buy at Asian supermarket – It is soy sauce base with dashi, and is sweeter with mirin). Whoa, this sounds amazingly simple! I love goma dofu, but have never considered making my own… Cookpad is the best! I know – But it really did come out like a real one, I surprised myself 🙂 Sooo great to have a fellow cookpad lover, thank you for your comment! !